Overall: The Amana ABR2037FES Bottom Freezer Refrigerator is a well built, attractive refrigerator, but in our view, a bit overpriced. You get a lot for your money such as the PuriClean® II retractable water/ice filter and internal dispenser as well as features like the Temperature-controlled Beverage Chiller™ compartment which stores milk extra-cold and the Electronic Temp-Assure® freshness design which puts consistent temperatures at your fingertips. Even though that seems like a lot we felt that at an MSRP of $2,600.00 we were left wanting more. If you're limited to a bottom freezer refrigerator due to space constraints, then this might be a model to consider, but if you have more space, you might be better off with another model. Capacity: This 19.9 cu. ft. capacity fridge lets you stock up on essentials, while the features are well hidden and avoid taking up too much of your storage space. This Amana Bottom Freezer Refrigerator also has 4 half-width adjustable Spillsaver™ glass shelves and 4 EasyGlide™ shelves that pull out so even way-back foods can’t hide. Style: The styling of this unit is certainly quite bold, but still somewhat conservative. Its sleek and modern looking style should blend well into just about any kitchen decor. The EasyFill™ internal filtered water dispenser is like having a faucet in your fridge and is quite convenient. Being an internal dispenser, you get the feature without the loss of space that comes with many in door units. The Temperature-controlled Chef’s Pantry™ drawer helps keep your meats and cheeses fresh. We really liked the SoftSounds system because it seemed to keep this refrigerator running very quietly. Colors: Our test unit was a Stainless Steel finish. It stood up well to fingerprints and scratches and the finish was very easy to clean, but you pay almost $300.00 extra for the stainless. MSRP: $1,900.00 was what the Amana ABR2037FES once sold for but the fact that this model has been discontinued allows for the retailers to bring it down substantially until it's gone. 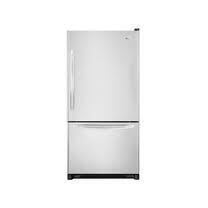 Your biggest decision now is whether or not you are comfortable purchasing a refrigerator that is discontinued. Whether you need a few more models to the Amana ABR2037FES Bottom Freezer Refrigerator, or if you definitely don't like the idea of a discontinued model, there are a few other Amana models worth looking at. Just click on one of the links below to see which one is right for you.